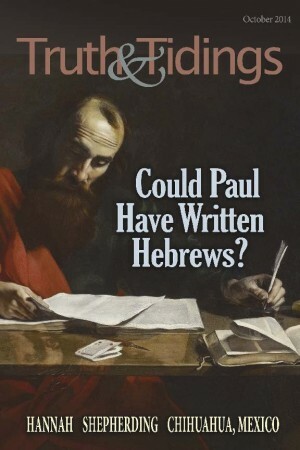 Hebrews’ Authorship (1): Could Paul Have Written Hebrews? We commenced the year with seven weeks of gospel meetings in the hall at Valle de la Madrid, which is where the assembly gathers in the city of Chihuahua. We have been greatly encouraged lately by the salvation of two Sunday school students. The first one, Héctor López, is 20 years old. He had attended regularly until he went to the USA to work with some relatives at the age of 14. Just last year, he returned to Mexico and began attending again. Remembering what he had learned as a child, he professed faith in the Lord Jesus Christ as his Savior. Another young man, 16-year-old Gustavo Mendoza, had also attended from a very young age. He had been raised by his grandmother since his parents were heavily into drugs. For some time he had considered himself saved, but realized he was unable to live the life of a Christian. He began listening with greater interest, and while at home, in simple faith, he received the Lord and believed in what He had done for him on the cross. Chihuahua is in the northern part of Mexico and, with a surface area of 247,087 square kilometres, is slightly larger than the United Kingdom. To the north it borders the American states of New Mexico and Texas. On the west we have the states of Sonora and Sinaloa; to the south, Durango, and to the east is Coahuila. The state of Chihuahua is divided into 67 townships. Its capital city shares the name Chihuahua. The largest city is Ciudad Juarez, located on the border with Texas, at El Paso. Other important cities are Cuauhtémoc, Delicias, Parral, Nuevo Casas Grandes, Camargo, Ojinaga, and Jiménez. Alicia and I arrived in Chihuahua 10 years ago, and have had the privilege of serving our Lord Jesus Christ here ever since. When we arrived, our daughter, Anagabriela, was only eight years old. Presently, she actively helps out in the work, and is on the waiting list for a spot as a student in the faculty of medicine at the university here in Chihuahua. We look back over the years and are humbled as we recognize that God truly has been faithful. We broke bread here for the first time on December 2, 2007. Valle de la Madrid is located in the southern part of the city, and it is where we have concentrated much of our labor. The weekly meetings are as follows: Tuesdays and Thursdays for prayer and Bible study, and Saturday for the preaching of the gospel. On the Lord’s Day we gather for the Breaking of Bread at 10am, followed by ministry of the Word. At noon is the Bible class and at 6:30 is the gospel meeting. Since 2011, we have celebrated an annual conference on the weekend closest to Mexico’s Independence Day, September 16. It is always a blessing to welcome Christians from other parts of Mexico and from other countries to hear the Word of God taught by the Lord’s servants. Believers here don’t often have opportunities to visit the works in other areas. This past May, our brother Blas Rodríguez, who is fruit of the work here in Chihuahua, had the joy of baptizing three young Christians. It was good to see many family members who came to hear the gospel and to witness the baptisms. Each Wednesday we travel about 28km to the northern part of the city where there is a hall in the area of El Porvenir. That work is primarily among children who live in extreme poverty, though a few parents attend the gospel meeting. On Sundays we return for a Bible class at 4 pm. The needs of the children in our country are ever increasing, with so many single mothers and children forced to live with grandparents, who are themselves suffering financially. Many homes are afflicted by the problem of drugs, which progressively destroys more and more of our society. These children have little chance of receiving a proper education, and many suffer from poor nutrition. During the past few months we have visited a couple who live in the city of Delicias, 80 km south of the city of Chihuahua. As well, we have worked with a family who live in Carichí, 150 km west of the capital city. As of yet, none have professed faith, but they have shown a keen interest in the salvation of their souls. We have also distributed texts and Via magazines in other cities that we are praying about: Cd. Juarez, Parral, Casas Grandes, Camargo, Jiménez, and Cuauhtémoc. All of them have a population of at least 100,000. On April 24, Anderson and Maria Eugenia Hernández, along with their three-year-old son Timothy, arrived in Chihuahua. They have been commended to the work of the Lord full time from Venezuela. They are living in the city of Chihuahua, with their sights set on the white harvest fields in this large Mexican state, and are depending on the guidance of the Lord of the harvest. “Finally, brethren, pray for us, that the Word of the Lord may have free course, and be glorified, even as it is with you: And that we may be delivered from unreasonable and wicked men: for all men have not faith” (2Thes 3:1, 2).